Displaying activity in the field of construction and real estate sector for over 30 years, with devotion to quality and respect to human and environment, Aksoy Construction successfully completed many projects at home and abroad, and became one of the leading brands in the high-end segment of the sector. Besides contracting/construction and real estate development activities based on project management as primary function and common ground, the company provides facility management services. The contracting segment, as the locomotive of the Company, undertakes unit price, cost+profit, and turnkey contracts depending on customer needs and project requirements. Various Bosphorus waterside residences, private villas and mansions, exurbs and luxury apartments, holdings, bank branches and head offices, offices, business centers, hotels, shopping malls, schools, hospitals, factories, and industrial facilities are some of the Company’s references. Aksoy Construction realized almost 200 projects with more than millions sqm total construction area. Housing construction jobs undertaken by AK-AL, founded in 1967 by Architect Erol Aksoy and his partners, later turned into design and general contracting business under Aksoy Construction and Trade as from the year of 1981. Having obtained a strong position in commercial building construction segment by construction of many branch offices in metropolitan cities and head office of Yapı Kredi Bank during 1970’s, the Company there after completed the construction of branch offices and head office of Garanti Bank, Imar Bank, International Bank and Pamukbank. 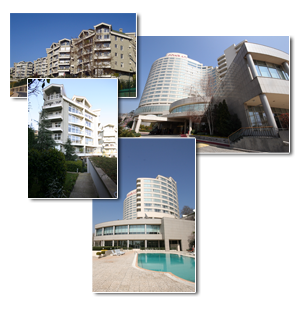 In mid-1980’s, the Company entered tourist facility projects with Altinorfoz Hotel in Mersin; and following the first experience in this segment, the foundation of Istanbul Conrad Hotel, which was the biggest five-star hotel of Turkey at that time, was laid by the Company together with Mr. Turgut Ozal, Prime Minister of that period. Having incorporated the industrial building sector to its product range during 1990’s, the Company completed significant construction projects such as Grundig Factory, Demirer Kablo Bozoyuk Factory, Pepsi Cola Corlu Factory. Construction of Tamek Holding’s administrative building and head office of Ernst & Young were undertaken in the same decade. The Company managed to incorporate prestigious residences, cultural centers and shopping malls to its product range during 2000’s. 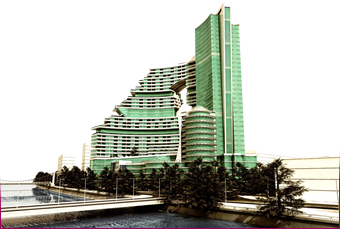 During the same period, The Company established Aksoy Group Batumi (AGB) in Batumi, touristic city of Georgia, which is known as former Riviera of former Soviet Union, to enter the Georgian property and construction sector. The residence of the president of Adjara autonomous region and industrial facilities in Petroleum Terminal of Danish-origin PCE are other significant projects of that period. During the following 10 years, when Turkey experienced local and global economic depressions, Aksoy Construction managed to maintain its continuity by going towards project development with its core personnel in contracting works. The Company still continues to develop and produce environment-friendly projects in construction and real estate sector.